Day 73 – Did you know? 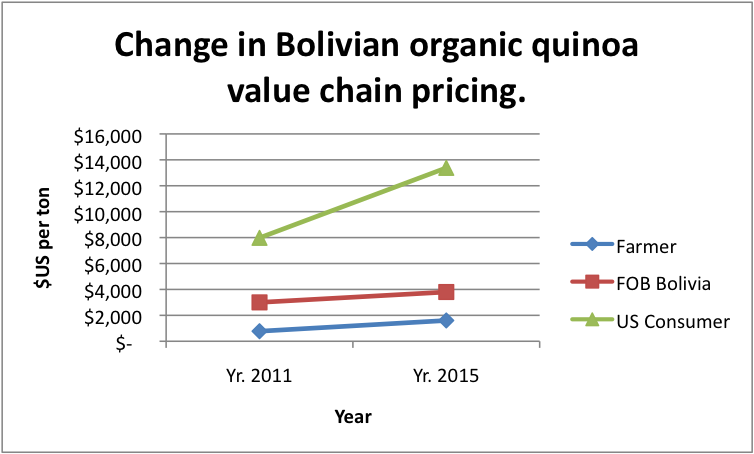 2015 was the first time prices differed in Bolivia between Fair Trade, organic and conventional quinoa. 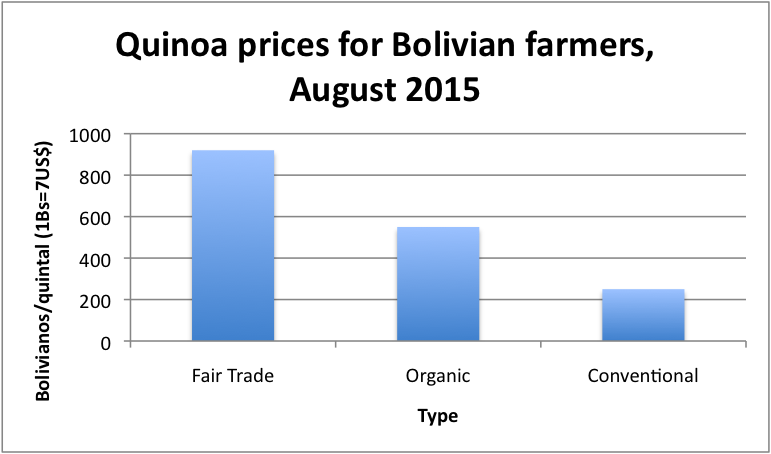 Quinoa has a relatively short supply chain usually with a single export buyer purchasing direct from the farmer. 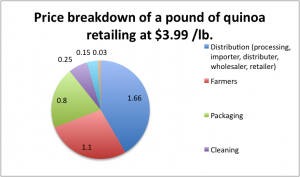 In this scenario, farmers can earn up to 27% of the final retail price. 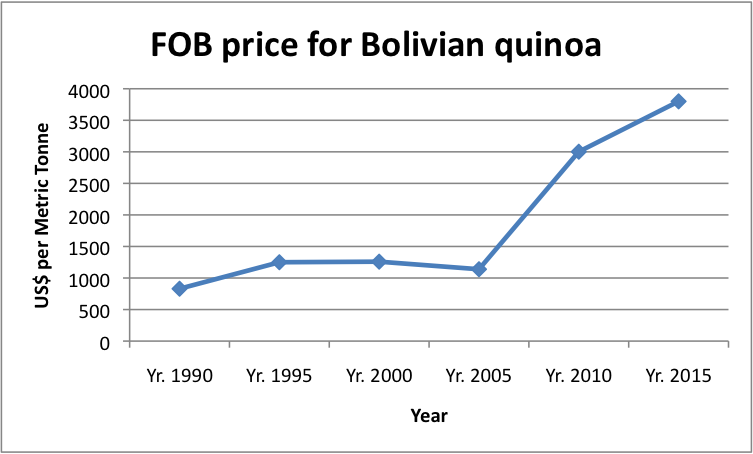 From 2005 onward, Bolivia’s quinoa exports have enjoyed steadily raising market prices. 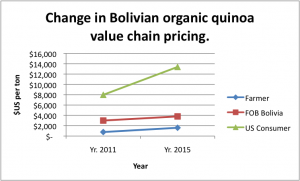 The downturn of the 2015 market has yet to make an impact on FOB since Bolivia mostly exports certified organic quinoa, which is holding a stronger price and the 2015 year has not yet ended. 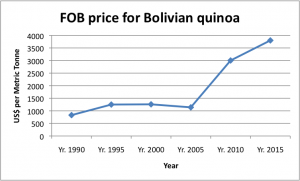 Though the base value of quinoa is rising as is the export price, the US consumer market has seen the greatest price increase. Continuing on with the analysis of the quinoa study data, it has come to my attention that one area that showed statistical significance amongst producers was membership in associations. Quinoa producers voluntarily joined or formed organizations for organic or Fair Trade certification. The government made it easy for these organizations to be formed and gave them legal recognition. Associations came with membership dues often paid with sacks of quinoa, voting rights, collective bargaining for market prices and technical assistance. Producers would join a single association, often with family members. Associations ranged in size from 30 to 80 families with three to four associations present in a region. These associations worked alongside each other, mildly competing for market access and members but mostly focused inwardly on serving member needs. Private agronomists were hired by the associations to provide technical assistance and tools to support quinoa production. A small, elected board of directors worked with large export buyers and oversaw the combining, processing, storing and sales of members’ quinoa. An association could easily sell four to seven shipping containers of quinoa a year representing 40,000 pounds of product per container with a current market value of $17,160 per container for certified organic quinoa and $29,920 for Fair Trade certified. Members were active participants in their associations, democratically agreeing on sales prices and budgets, attending mandatory monthly and annual meetings, and being decision makers. In total almost a third of people surveyed were members of producer organizations with the bulk (83%) coming from Salinas. Of this, 70% were members of Fair Trade associations and 30% certified organic associations. The Fair Trade associations were also certified organic and worked with both markets depending on buyer demand. 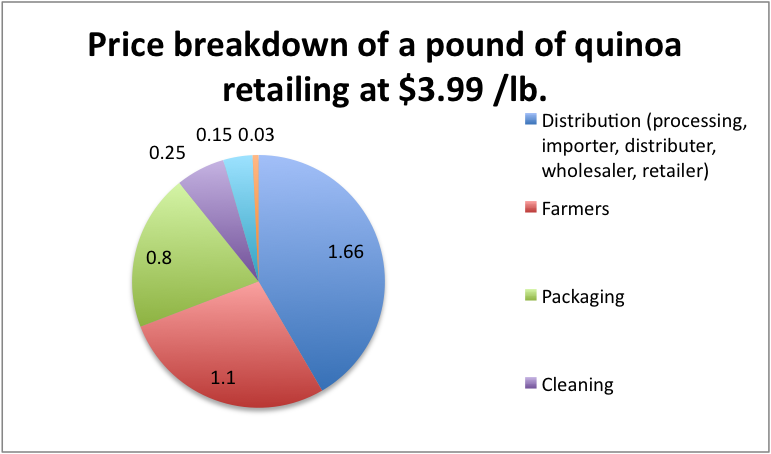 Because of its high price and lack of consumer awareness there was more demand for organic rather than Fair Trade quinoa resulting in Fair Trade associations having to sell their Fair Trade quinoa at the lower, certified organic, market price. The rest of the study participants were conventional producers, who mostly farmed with organic methods but did not have a certification. When asked why they did not join an association, many replied that they did not see the value of it, did not feel committed enough to their production to do it, or did not want to take the time for it. Historically independent producers enjoyed the same high market prices and access as association members. Now with the recent market changes this has shifted. 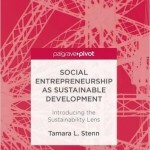 Regardless of where they were from, producers in associations, both Fair Trade and organic, had statistically significant more positive experiences in their political environment and community decision making. 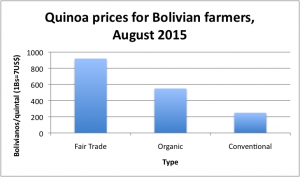 This could be due to the tremendous economic power that associations provide and their highly participatory, democratic operations which were empowering for producers who were historically some of the most marginalized people in Bolivia. Environmentally all association members reported statistically significant gains in the areas of wildlife, a clean environment and recreational spaces. As part of their organic certification, many association members were using better composting, sanitation and recycling methods reducing the trash and environmental contamination in the countryside. Economically only Fair Trade association members reported a statistically significant positive outcome with 82% reporting their income to be satisfactory to excellent. Only 68% of the certified organic only association members ranked their incomes as satisfactory to excellent. In addition 80% of the Fair Trade association members found their market access in general and for export to be satisfactory to excellent while only 45% of the certified organic only association members felt that way. All association members felt their culture was highly valued and showed a statistically significant positive response in the areas of culture value, traditional dress, community festivals, language and indigenous wisdom. The Fair Trade association members in particular showed a strongly positive response to having their culture valued. This could be that the Fair Trade requirements of association membership, democratic participation and community building, resonates with the indigenous values that the people of the region practice.